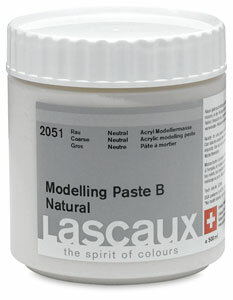 Lascaux's modeling pastes offer the artist a ready-to-use paste to build structure for relief painting. Used with a spatula or painting knife, modeling pastes dry without cracking, even when applied in thick layers. They create a surface that is hard, opaque, and sandable. Mix them with Lascaux Acrylics in any ratio for direct painting, or use them on their own. Create a variety of textures and colors. To minimize drying time, apply several thin layers. 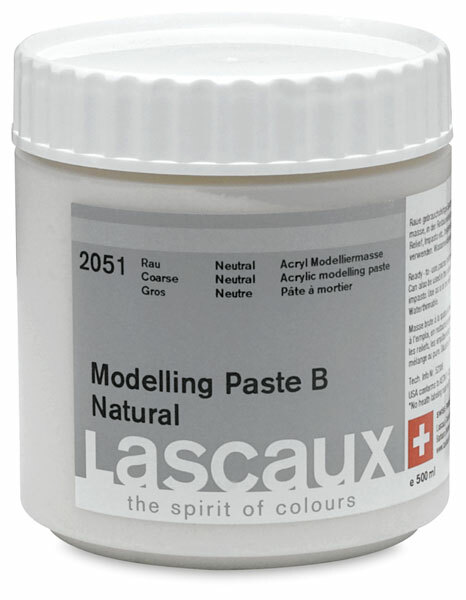 Modeling Pastes A and B — Lascaux Modeling Pastes are suitable for creating reliefs, impastos, and textured or fresco-like surfaces, as well as for embedding collage materials. Paste A is a finely ground paste that dries to a smooth, sandable finish. Paste B incorporates approximately 33% silica sand and dries to a rough surface.